Fukuoka is a major city in Kyushu, and a famous sightseeing destination. This complete area guide of Fukuoka introduces the best sightseeing spots in the city, as well as places where visitors can enjoy the tasty local cuisine and shopping. Fukuoka is the largest city in Kyushu. The city boasts large shopping centers such as JR Fukuoka City and Canal City Hakata, as well as delicious local cuisine such as motsunabe (a type of hot pot dish), tonkotsu ramen, mentaiko, and yakitori (skewered grilled chicken meat). At Nakasu, an entertainment district in the Hakata ward of Fukuoka, many food stalls called "yatai" appear at night, offering visitors warm, tasty dishes such as ramen and oden. In this article we put together an area guide of Fukuoka. If you're traveling by shinkansen you'll arrive at Hakata station, but if you're flying, you'll have to find transportation from the airport to the city area. - Subway from the airport's Domestic Terminal 2 basement floor, Fukuoka City Subway Airport Line (For Meinohama/Chikuzen-Maebaru station) - about 5 minutes, 260 yen. If you use a taxi, you'll be able to reach Hakata Station in about 20 minutes for 1300-1400 yen. Buses for Hakata Station and Tenjin are available from the Domestic and International Terminal 1st floor bus platform. Domestic → Hakata Station Bus Terminal: About 15 minutes, 260 yen. International → Hakata Station Chikushiguchi: About 15 minutes, 260 yen. Hakataguchi: About 20 minutes, 260 yen. Two stations from the subway Fukuokakuko (Airport) Station whose entrance is located on the basement floor of the Domestic Terminal 2 building. Use the free bus when heading to the Domestic Terminal from the International Terminal. To Hakata Station: About 5 minutes, 260 yen. About 20 minutes from Domestic Terminal, approximately 1400 yen. About 20 minutes from International Terminal, approximately 1300 yen. Times and fares may differ depending on traffic. There are various unique sightseeing destinations in Fukuoka, such as Kyushu's largest shopping spot Tenjin, gourmet district Nakasu, and the Dazaifu area, where Dazaifu Tenmangu Shrine and the Kyushu National Museum are found. Now let's take a look at the characteristics and must-see places of each area. The first thing you'll notice upon arriving at Hakata Station is its size. Inside a large shopping facility called JR Hakata City Amu Plaza Hakata there are over 200 shops, including Hakata Hankyu Department Store, Tokyu Hands Hakata, fashion stores, restaurants, and other variety goods shops. On the top floor of JR Hakata City is a rooftop garden called Tsubamenomori Hiroba. From the observation deck, visitors can enjoy a 360 degree view of the city of Fukuoka. Within the garden, you can also find the Tetsudo (Railroad) Shrine, which prays for the safety of railways, as well as a mini train for children to ride around on. Families can enjoy shopping and relax here at JR Hakata City. Also around the station, there are old-fashioned alleys, as well as relaxing spots such as the Japanese garden Rakusuien and Sumiyoshi Shrine. Fukuoka's Nakasu is known as one of Japan's "Three Great Entertainment Districts" along with Kabukicho in Shinjuku and Susukino in Sapporo. From Hakata Station to Nakasu it's about a 15-minute walk. Many yatai (food stalls) line the streets at night, offering savory foods such as oden, ramen, and yakitori, and the area is always bustling with locals and visitors. The entertainment facility Canal City Hakata is also located in Nakasu. Let's check out in more detail what's so special about the area. You don't want to miss out stopping by at a yatai (food stall) when visiting Nakasu. Here, you can find various types of yatai selling popular dishes such as tempura, gyoza dumplings, ramen, udon, and yakitori. You can even find western food and fusion cuisine, as well as alcohol. If this is your first time visiting the Nakasu food stalls, we recommend you purchase the Yatai Kippu Ticket. This ticket can be found at JR Hakata Station and the Tourist Information Center within the Lion Hiroba right below Nishitetsu Tenjin Station. The Yatai Kippu is a ticket that allows you to enjoy a recommended dish from one yatai as well as a drink for 1050 yen (including tax) per ticket. It can be used at 12 different stalls supporting the Yatai Kippu. - Manryu - known for its juicy oden. - Ahotare-no - Mexican food and fusion cuisine. - Haruyoshi Ramen - ramen and grilled ramen. - Shokichi - famous for gyoza (winged dumplings) and other dishes. There are 12 stalls in total. You can purchase several tickets and hop around various stalls. Most food stalls start business from around 18:00 when the sun goes down. Many stalls are already crowded by 21:00, so it might be a good idea to head there early. There's a rumour that certain food stalls charge more to foreign visitors or to persons who are already drunk. If you're worried about this, you should select a stall that has the prices written clearly, or one of the Yatai Kippu accepting joints. Canal City Hakata is a commercial facility in the Nakasu district. It includes restaurants, a movie theater, various shops, and a hotel. It's like a small city in itself. We recommend visiting the Ramen Stadium. It's a restaurant floor just for ramen where visitors can enjoy nine different tastes of ramen from around Japan. Of course, you'll be able to find three or four Hakata ramen joints there as well. It's a shop that will satisfy the ramen needs of those craving genuine Fukuoka tonkotsu ramen, as well as those who want to eat and compare the tastes of ramen from around the country. There is a Japanese-style building in the Nakasu area that stands out among the rest. This is the Hakata Machiya Furusato-Kan. It's a facility that shares the history and culture of Hakata, as well as the lives of the people of Hakata in the Meiji (1868 - 1912) and Taisho (1912 - 1926) period and traditional crafts. At the Miyagedokoro (souvenir shop), you can find Hakata Ningyo (porcelain Hakata dolls) made by local craftsmen. The shop is a great spot for Hakata souvenirs. Right in front of Hakata Machiya Furusato-Kan is Kushida Shrine, which is known for the Hakata Gion Yamakasa Festival. Nakasu is an area that offers modern shopping malls and traditional old-fashioned Hakata culture at the same time. Tenjin is Kyushu's largest shopping spot. Many department stores and fashion joints line the streets. Tenjin Core offers casual fashion items for young customers. If you're in search of gal-style or kawaii-style clothing, stop by here. IMS is a building that has variety shops, fashion shops, cafes and restaurants, and event spaces. The center of the building has an open ceiling. IMS is a great place to stop by for some casual shopping. Solaria Stage is an underground shopping street connected directly to Tenjin Station. It handles mainly women's clothing. Suikyo Tenmangu is a famous shrine located in the Tenjin area. It worships the god of education, Sugawara no Michizane, and attracts many students during the entrance exam season. The old Nippon Life Insurance Company Kyushu branch building, built over 100 years ago in 1909 (also known as the Fukuoka-shi Akarenga Bunka-kan) is a building that includes 19th century British-style architecture. It has been designated a National Cultural Property and has become a museum open to the public. Quite close to Tenjin, there is the Dazaifu area. 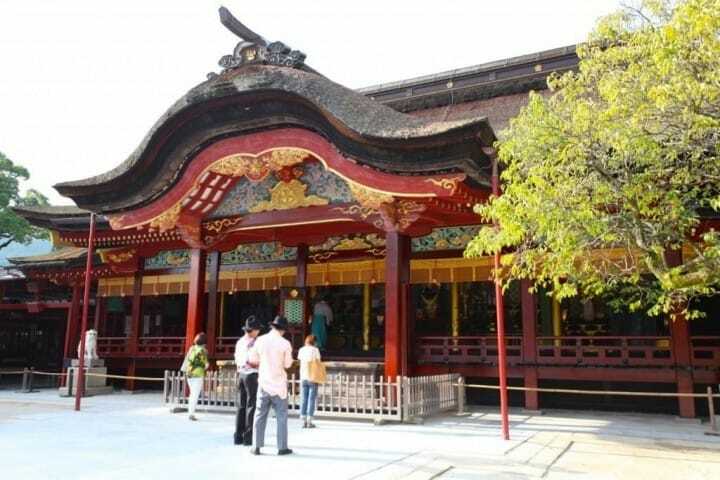 Dazaifu boasts many sightseeing attractions, such as the Dazaifu Tenmangu Shrine, Kyushu National Museum, and Komyozenji Temple. Dazaifu Tenmangu is also a shrine dedicated to the god of education, Sugawara no Michizane. Students from all over Japan visit the shrine during the entrance exam season. At shops in the surrounding area, you can purchase umegaemochi, a snack with anko (sweet bean paste) inside a baked mochi. The Kyushu National Museum was the 4th museum to be built in Japan. It's known for its exhibitions about the Japanese culture from the Paleolithic Age to the end of the early modern period. Komyozenji is a temple with a beautiful moss garden. We recommend visiting in the fall when the garden is covered in magnificent autumn leaves. Seaside Momochi is an area by the sea. You can reach here in about 25 minutes by bus from Hakata Station. In this area you will find many of the symbolic buildings and parks of Fukuoka: Seaside Momochi Seaside Park, Marizon, Fukuoka Tower, Fukuoka City Museum, Fukuoka City Library, and Momochi Chuo Park. Parks like Momochi Chuo Park and Momochi Seaside Park are recreation spots for the locals. If you're feeling a little tired from your travels, you can stop by to relax. Enjoy Your Trip to Fukuoka! Fukuoka has many points of interest, from large shopping malls to beautiful shrines and historical buildings. How about choosing Fukuoka for your next holiday destination? The FUKUOKA 1 DAY PASS for both the Nishitetsu trains and buses is convenient for sightseeing in Fukuoka. It's a ticket that allows unlimited rides on the Nishitetsu buses that run in the Fukuoka, Kurume, Saga, and Chikuho areas, as well as the Nishitetsu Tenjin Omuta Line from Fukuoka (Tenjin) Station - Yanagawa Station, and the Dazaifu Line and Amagi Line. Visitors can enjoy sightseeing attractions such as Hakata Station, Tenjin, and Dazaifu all with this ticket. The price is 2,060 yen for adults and 1,030 yen for children. Fukuoka has great food, shopping spots, and a rich history. Visit once and you'll fall in love with the city.